The right clothing and equipment is of vital importance to the survival and effectiveness of military personnel. 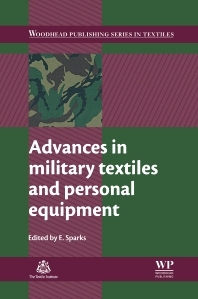 Advances in military textiles and personal equipment summarises key research on the design, manufacture and applications of military textiles. Beginning with an overview of design issues, part one explores anthropometric methods, psychological, colour and camouflage issues related to the successful design of military textiles. Materials and design issues in military helmets, footwear and hand wear are also reviewed. Part two goes on to consider applications of particular types of military clothing and equipment, including optimisation of body armour design, high performance ballistic protection using polymer nanocomposite technology as well as advances in materials and modelling of chemical, biological, radiological and nuclear protective clothing. Finally, Advances in military textiles and personal equipment looks specifically at designing load carriage and advanced hydration systems for military personnel. With its distinguished editor and international team of expert contributors, Advances in military textiles and personal equipment is an invaluable resource for all those working in the design, manufacture and production of military clothing and equipment, as well as for the defence industry itself. Military textiles designers and manufacturers; specialists in technical textiles; defense procurement engineers and suppliers. Dr Emma Sparks is a Course Director in the School of Defence and Security, Cranfield University, an academic provider to the Defence Academy, UK.